Facing the uncertainty of their present life and ministry, the American and Canadian churches of mainline Protestantism are, for the most part, responding in one of two ways. Some are simply choosing to ignore the process of their disestablishment. They continue to carry on with their church life as though nothing were happening, as though they were still occupying a place at the center of society. Others, knowing that they are being moved to the periphery of social and political life, are seeking to regain their past power and influence by adopting one or another program of church growth, many of which are being promoted by the newly emerging megachurches of the Christian right. Based upon the history and experience of a particular congregation, Church of the Crossroads in Honolulu, Hawaii, this book suggests a third option for the churches of mainline Protestantism: to embrace their ongoing disestablishment and to see it not as a burden or as something to be either ignored or reversed, but as an opportunity to envision a new way of being in the world. Readers of Neal MacPherson's book will find both encouragement and practical help in his depiction of this remarkable congregation. --Douglas John Hall, CM, Emeritus Professor of Christian Theology, McGill University, Montreal, Canada. ""As Christendom dies, real Christianity, which, as Chesterton said, has been 'so little tried, ' looks for a way into the future. And wherever Christians are serious enough to let go of the tired old forms their religion has assumed in its long and established past, they are discovering the courage and imagination necessary to put the good wine of the gospel into new ecclesiastical wineskins. Some of these wineskins will no doubt burst. Some already have. But some will survive and will prove sources of energy, wisdom, and human hope for the century ahead. The Church of the Crossroads, in my belief, is one of the latter."" 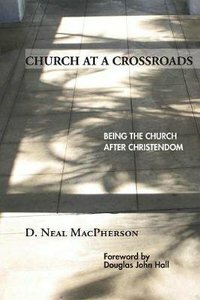 --from the foreword For the past nineteen years, D. Neal MacPherson has been the pastor of Church of the Crossroads United Church of Christ in Honolulu, Hawaii. This is his first book. About "Church At a Crossroads: Being the Church After Christendom"